In May, the world was shocked to hear the terrifying news revolving around a crazed man who attacked and ate the face of another man in Miami. The attacker, Rudy Eugene, was shot and killed by police while his victim, Ronald Poppo, was left severely wounded and blind. Poppo finally broke his silence and described the disturbing ordeal to Miami homicide Detectives Sgt Altarr Williams and Frankie Sanchez in July. His statements were obtained by the media last Wednesday. Poppo went on to describe Eugene as talking “funny”, insisting that they both were going to die. 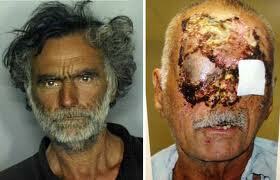 Poppo concluded that his attacker must have been on some type of drug. 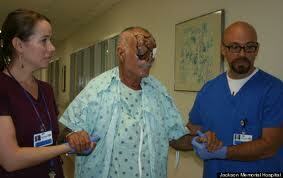 Eugene chewed off about 75% of Poppo’s face during the attack, leaving the man blind. Poppo was immediately rushed to Jackson Memorial Hospital where he underwent several surgeries and was then transferred to Perdue Medical Center for long-term care. The 65 year-old is currently still homeless and jobless, making for a more difficult situation. The man did not get upset during his talk with detectives but did become uncomfortable as he detailed what happened.